Built as wooden cargo or whaler by A. Herlofson at Arendal, Norway for Colin Archer?. September 1886 launched as the POLLUX. Tonnage 522 gross, 276 net, dim. 146.5 x 20.7 x 17.6ft. One triple expansion steam engine 90 rhp. , speed with nice weather under steam around 9 mile. Most probably used under Norway flag as a sealer. 30 August 1898 the SOUTHERN CROSS under command of the Norwegian Capt. Bernhard Jensen and with on board 27 persons and 90 dogs and provisions for three years sailed from London and via Madeira, Santa Cruz and St Vincent, passed 23 September the equator and arrived at Hobart, Tasmania on 28 November 1898. 17 December 1898 sailed from Hobart and headed for the Antarctic waters. 31 December she met the first pack-ice, 12 January passed Ballenyøyene, and she anchored off Cape Adare on 17 February. After the overwintering party of 10 men was landed and a base camp was erected and all the needed equipment and stores were discharged the SOUTHERN CROSS headed north again on 2 March. Borchgrevink named the camp after his mothers maiden name “Camp Ridley”. 16 March the SOUTHERN CROSS arrived in Port Chalmers, New Zealand from where she sailed to Wellington. The SOUTHERN CROSS sailed the next year back to the Antarctic and when all men of the overwintering party were embarked she sailed on 2 February 1900 for the return voyage. They sailed first south to the Ross Ice Shelf where some men landed and made a ski and sled walk for some 10 miles land inwards. 18 February everybody was safe on board again and course was set to the north, arriving 21 March in Auckland, then via Hobart where Borchgrevink left she sailed to London where she arrived on 29 October. After arrival she was sold to Daniel Murray and Thomas Crawford of Glasgow, she was fitted out by Baine Johnston as a sealer. Under command of Capt. Darius Blandford it sailed to Newfoundland, thereafter used for the seal hunt from 1901. She was that season the first ship which returned in port with a full load of 26.563 pelts. 31 March 1914 under command of Capt. George Clarke from Brigus and with on board 173 men and 17.000 to 20.000 seal pelts underway from the hunting ground in the St Lawrence to her homeport St Johns, during the voyage she met bad weather with heavy snowfall, on 31 March she was sighted by the steamer PORTIA during very bad visibility in a position of about 5 miles west-south-west from Cape Pine, New Foundland. Thereafter not anything more was heard of the SOUTHERN CROSS, a search was made by other vessels but noting was found of her and on 3 April the SOUTHERN CROSS was officially declared lost with her 173 men. The only sighting was made on board of the BLOODHOUND when she reported after arrival in port that she sighted quantities of wreckage near Cape Race as a number of seal pelts, but the crew was unaware of the disaster. Her loss was the greatest loss of life in any Newfoundland sealing disaster. Source: http://www.miramarshipindex.org Dictionary of Disasters at Sea during the age of steam 1824-1962 by Hocking. Many web-sites. 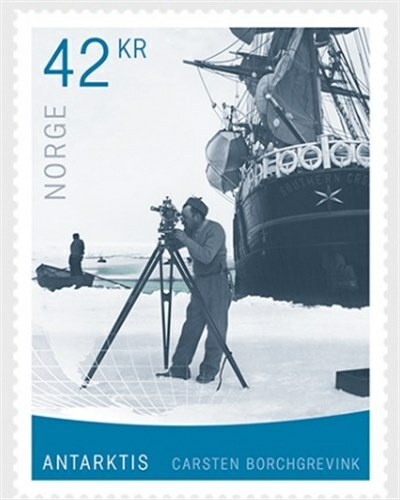 Norway issued in 2019 two stamps for the Antartica, of which one stamps shows the port side and part of the stern of a ship in the polar ice. 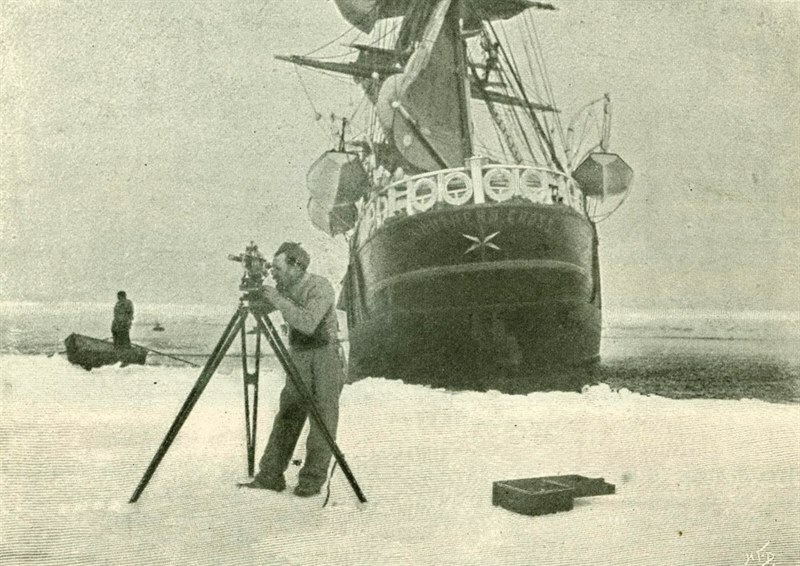 Near the ship is standing on the ice Carsten Egeberg Borchgrevink using a theodolite instrument. The vessel depict is the British vessel SOUTHERN CROSS. Queen Maud Land, which was annexed by Norway in 1939, is almost seven times larger than Norway – and constitutes one-sixth of the total area of Antarctica. James Cook was the first person to offer a detailed description of the waters around the frozen land mass called “Terra Autralis” from his travels in 1772and the years that followed. It was not until 1819, though, that the first real expedition took place when Russian czar Aleksander Isent an expedition under the leadership of Admiral Fabian Gottlieb von Bellingshausen. Later, a number of expeditions were made to Antarctica. It is said that William S.Bruce from Scotland was the first person to set foot on Queen Maud Land, but it was the Norwegians who would be the first to actively map the area. The objective of the Norwegian annexation of Queen Maud Land was not to exclude other states but rather to prevent the Norwegian whaling industry from being excluded or treated disproportionately as a result of the activity of the other countries. Several Norwegians have been prominent in the exploration of Antarctica. 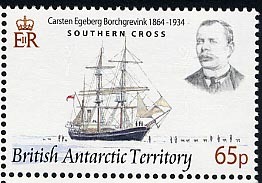 Polar researcher and explorer Carsten Egeberg Borchgrevink was a pioneer – and he established much of the basis for later expeditions led by Robert F.Scott, Ernest Shackletonand Roald Amundsen. Borchgrevink’s career in Antarctica started in 1894 as a member of a Norwegian whaling expedition, and he was one of the first to gather samples of living, organic material south of the southern Arctic circle. Norway 2019 42Kr. sg?, scott?